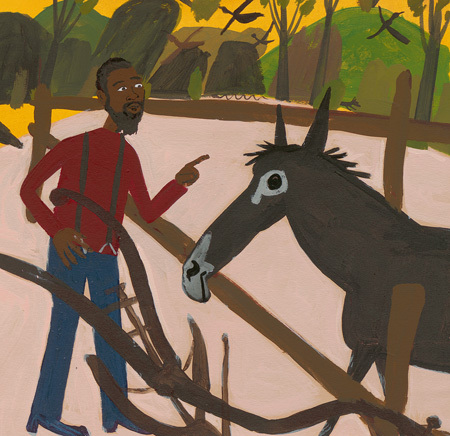 It Jes’ Happened: When Bill Traylor Started to Draw is the picture book biography of self-taught (outsider) artist Bill Traylor, a former slave who at the age of eighty-five began to draw pictures based on his memories and observations of rural and urban life in Alabama. Don Tate and R. Gregory Christie have created a lively tribute to a man who has enriched the world with more than twelve hundred warm, energetic, and often humorous pictures. In this BookTalk, Don and Greg discuss the writing methods and research behind It Jes’ Happened. 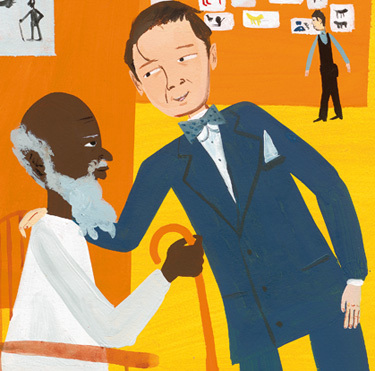 Prior to It Jes’ Happened: When Bill Traylor Started to Draw the world of children’s publishing only knew you as an illustrator, Don. What made you decide to take the leap and become an author? Don Tate: Encouragement from friends. When I first entered the world of children’s publishing, I didn’t consider myself a word person, so I didn’t try to write. Austin, Texas, is home to a vibrant and supportive children’s and YA writing community, especially the SCBWI. It’s likely I wouldn’t have made the leap to becoming an author had I not moved here. Feedback from writer friends boosted my confidence. Don, why did you decide that your first book would be nonfiction? Do you have any interest in writing fiction as well? DT: I love reading true stories about real people, so for my first attempt at writing, it made sense that I chose to write about none other than a real person. As a child, I wasn’t much of a reader. If I were found with a book, it would have been an illustrated encyclopedia or our family’s illustrated medical guide. Real stuff. I do feel the pressure to write more commercial fiction. I’m told that’s what sells best these days. But those types of stories don’t excite me as much. One of these days I will write fiction. But first I have a few real stories I need to write. In nonfiction, there is a need to preserve a storytelling voice while reporting on a real set of events. How do you make sure that the story stays engaging while simultaneously giving readers the facts? DT: I used a rhythmic voice. When I write, I verbalize my words out loud. I like to hear what I’ve written. I need to hear my voice. I enjoy rhythmic prose, and I think young readers do too. For It Jes’ Happened, I used a refrain, “Bill saved up memories of these times deep inside himself.” I varied the words slightly with each use so it wouldn’t feel redundant. The refrain served as a tool for transitioning the events of Bill Traylor’s life from scene to scene. Hopefully the bouncy text will engage readers. 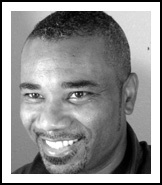 R. Gregory Christie: In terms of visual storytelling, I find that it’s important to stay consistent with color choices and each character’s likeness but also to keep the reader engaged by varied compositions and visual viewpoints. Have you ever had to tackle writer’s block? If yes, how did you overcome it? DT: Typically I don’t get writer’s block. I figure as long as I can see, hear, taste, touch, and smell, I have something to write about. Ideas always flow. Fleshing out those ideas, however, is where I can get hung up. More often than not, writer’s block simply requires more writing. I just gotta write anyway. RGC: As an artist, sometimes the desire and ease to create compelling work leaves you. The important thing for me is take a break from it, find something else productive to do with my time. Even the experiences you’ll find outside your studio connects you to life and the people around you. Which in my opinion helps your artwork become more universal. So in short, take a walk, go people watch somewhere. I feel that it will help to give you a greater understanding of human nature and the emotions that come with it. Don and Greg, what was your research process like for this picture book? DT: I began telling Bill’s story by drawing a timeline. As I researched his life, I plotted dates and sources on the line. As a visual person, it was helpful to see Bill’s life laid out in graphic form. The graphic revealed problems I needed to address. The dates of events in his life varied widely from source to source. Even his birth and death dates were in question. There were other problems, too. Much had been written about Bill’s life after he began drawing in his 80s. But not much was known about the previous 80 years of his life. To learn about Bill’s life as a slave, and later as a sharecropper, I studied his art. Bill’s drawings serve as a visual journal. A common theme in his art reveals men with mules and plows. Obviously Bill spent a lot of his time in fields behind a mule and a plow. His drawings of “Exciting Events” reveal late night parties followed by hunting with horses and dogs. His drawings of preachers encircled by worshippers tell me that Bill probably participated in, or at least witnessed, a lively worship experience. RGC: Mainly looking at Traylor’s original artwork in various museums and delving into any coffee table book featuring his art that came my way. I had to let go of my own sensibilities in order to understand what Bill Traylor was doing. Then after some time reconnected the two in order to make the art for this book a homage. But let me be clear this is a homage that had Traylor laying all of the groundwork. Give three adjectives you would use to describe Bill Traylor’s artwork for those who are unfamiliar with him. In your opinion, what does a street artist have to offer that a traditionally-trained artist may not be able to? RGC An ability to turn things all around and make it right because of the way it ”feels“ in addition to the aesthetic. Also a boldness to try anything, but that depends on the type of street artist. Don, for the readers who are considering traveling to Texas, what attractions would you recommend for them? Greg, what are your suggestions for Georgia? DT: The Texas State Capitol building is a must-see. Truly a work of art. And it’s pink! Much like the cover of It Jes’ Happened. I’d also recommend The Bob Bullock Texas State History Museum, or the LBJ Library & Museum. RGC: The Aquarium, Center for Puppetry Arts, Fox Theater, Desta Ethiopian Cuisine, and of course my store: Gas-Art Gifts, in Decatur. Who are some of your favorite children’s book illustrators? Why? DT: Illustrator Mark Teague is one of the most successful children’s book author-illustrators out there, I love his books. 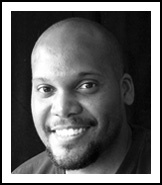 His degree is in history, but he is a self-taught writer and illustrator. Like me, he learned illustration by trial and error. That inspires me. I’m also inspired by artists not particularly known for one trademark style. Most successful illustrators are known for being the best at their one style. But artists like Paul O. Zelinsky, Daniel Kirk, Eric Rohmann, they’re known for being the best at every thing they touch! They’re constantly remaking themselves, trying fresh new things, surprising us. Cool, that’s what I want to aim for. I can’t forget Brian Pinkney and Floyd Cooper, who gave me great advice and critiques early on in my career. And of course, I’m the biggest R. Gregory Christie fan. But I may be biased. RGC: Tom Feelings, he had a way of making drawings that had so much character. Chris Rascha, I think he is pretty brave and seems to be challenging himself with new visual paths. Jerry Pinkney, solid as a craftsman and for his amazing ideas for composition. On and on, there are so many other amazing people in this industry. But let me speak of Don’s work. He has a great color sense and acumen and an ability to do topnotch visual storytelling. I was honored to be asked to do the art for this book. In a country where educational institutions are constantly cutting out art programs due to budget constraints, do you have any tips for teachers or parents on how to instill art appreciation in their children? RGC: Use the internet as an educational tool for yourself. Watch videos, visit forums, and think of arts and crafts as an addition to your curriculum. Do not be intimidated by thoughts of not having an art background. 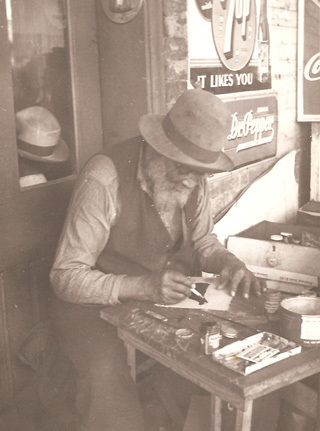 Some of the best artists were never trained, case in point: Bill Traylor. Try out some of the exercises that you can find as video instruction and I’m sure that the students will embrace what you offer. RGC: At this point I’m mentoring and becoming an art teacher through my shop, Gas-Art Gifts in Decatur, Georgia.